I’m going to have to be honest right up front and say that I’ve never really understood the fascination and awe that Behemoth have managed to conjure over the past five years or so, I mean, they’re good and all, but are they really that good? I remember hearing the band back in their black metal days and I guess they must’ve made enough of an impression on me at the time because I checked in on them every now and then, experiencing some great releases (and musical changes) along the way like Satanica and Thelema.6 right up until Zos Kia Cultus but found my attention and interest in the band had waned considerably by the time Demigod and The Apostasy made them into the powerhouse they are today. Irrespective of this, early reports of Evangelion, Behemoth’s ninth full length release, were nothing short of stellar so my interest was immediately piqued. As much as I’m surprised to be saying it, those reports were absolutely spot on. Evangelion is a monster of an album. The sheer ferocity with which album opener Daimonos is thrust upon you is nothing short of incredible. Though highly powerful and atmospheric, the urgency of the material is what is immediately apparent and is what permeates each and every track on Evangelion. It is the unseen force that binds the blasts of fury together for the album’s 40 minute plus duration and allows the material to remain fresh. This of course is assisted through some creative riffing from Nergal who has honed his craft to the point that he appears to almost have a sixth sense about when to change things up in a song to keep things interesting. Indeed, the inclusion of some almost rock and roll guitar solos here and there are a somewhat surprising though no less welcome addition to the overall sound of the album. 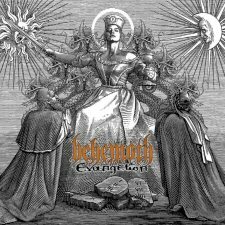 Behemoth’s music has frequently been compared to that of Morbid Angel and Nile (and not without good reason either) but, while those similarities are still present on Evangelion, this time around I also hear a strong late era Hate Eternal influence thrown into the mix as well in amongst the Nile-esque Middle Eastern melodies. Much of this comes directly from the drumming of Inferno who has turned in a masterful performance behind the kit showing not only great dexterity and speed but also the ability to keep his playing interesting. He doesn’t fall into the common trap of making the album a blast fest from start to finish which is always a good thing in my book. Something that turned me off Demigod and, to a lesser extent, The Apostasy was the layering and over-processing of Nergal’s vocals. I found this technique detracted from the overall effectiveness of the material by making it sound far too artificial. I’m thankful to say that Evangelion is as organic and real sounding as I’ve heard Behemoth for some time now and the album benefits from this immeasurably. There is a rawness to the music that amplifies the intensity and allows the emotion behind the music to shine through with much more clarity than on the two albums that preceded it. Evangelion is far from a revolutionary step for Behemoth but is rather a further refinement of a very well established sound and formula. This may sound like a negative point but it is, in fact, the best compliment I can muster. How else can one praise a band that has reached the upper tier of the blackened death metal pile but still manages to improve year after year, album after album?